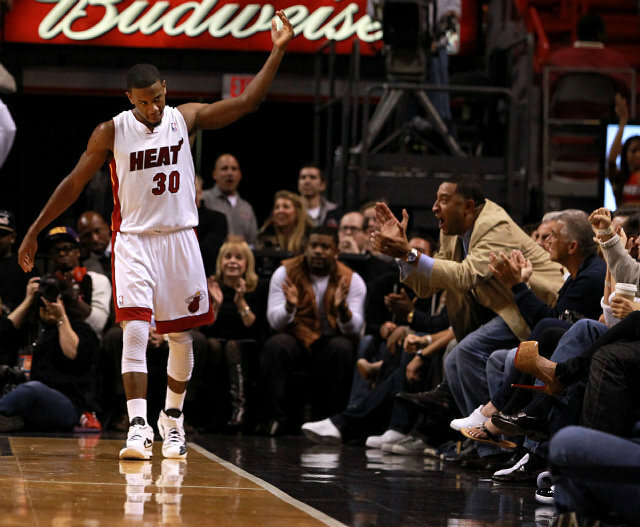 The emergence of Norris Cole has given Miami a huge lift. The frontline of Pau Gasol and Andrew Bynum are imposing, but can Kobe Bryant’s wrist hold up the entire season? The Pacers have been dominating their opponents on the glass giving them more opportunities. I wonder what this team would be like if J.R. Smith, Wilson Chandler and Kenyon Martin weren’t held hostage in China. With Manu Ginobili going down, Richard Jefferson, Gary Neal and Danny Green have been able to pick up the slack. How long can they hold up? It’s hard to get a grip on this team with their early ups and downs. They’re still mentally weak. As long as Dwight Howard is on the roster, the Magic will always be contenders. The Blazers already have impressive wins over the Lakers, Nuggets and Thunder early in the season. Will Kevin Durant and Russell Westbrook be able to co-exist the entire season? With the league’s top defense and point guard Derick Rose; this team is always going to be a challenge. Even though Dwayne Wade and LeBron James are banged up, this team has enough depth to recover. Mario Chalmers and Norris Cole have been both great thus far. It’s still way too early to find the true identities of each team but it’s safe to say Miami is clearly the favorite right now. The Mavs are still celebrating their 2011 NBA Title and Boston’s age is catching up to them. On the other hand, Chicago isn’t to far behind. The emerging Grizzlies look to make a late playoff push, but they will face a huge test as 9 of their final 16 games will be against potential playoff teams. The Thunder have given up over a hundred points in four consecutive games. Where’s the defense! They could use Perkins right about now. The lack of a point guard and bench have really exposed this team. Perhaps a win against LA can turn everything around? Orlando wraps up the season with 11 of the final 17 games on the road. The Magic could run into some trouble since they have been average on the road this season. With the addition of Gerald Wallace and Brandon Roy’s return from injury, the Blazers just got that much scarier. The Mavs allowed the Hornets to go on an 8-0 in the final minute to blow a 7-point lead. Soft is right. Am I the only one who thinks the Perkins trade made the Celtics worse? Despite getting spanked by the Lakers at home, at least Tony Parker is back from his calf injury. Murph told me the other day that any team that starts Keith Bogans (or Rasual Butler) at the two-guard has no business playing in an NBA Finals. Despite Rose’s heroics, I believe that statement. The Lakers have turned it on since the All-Star break, finally looking like the defending champs. They are currently riding an eight game win streak, and during that streak, they have only allowed 100-points once, and that game happened to go into overtime. The Grizz have won 6 out of their last 7 with Zach Randolph playing like a stud. It will be a shame if he is left out of the All-Star game. He is a solid double-double any given night. Mike Conley has also come out of his shell stacking up back to back double-digit assists. Unfortunately, Memphis is one key-player short of a solid play-off run and it doesn’t help with O.J. Mayo being suspended. The Thunder have looked sluggish as of late, splitting their last four games in which two of the victories came in overtime. The Mavs have slowly gotten back onto track as they ride a five-game win streak. There is no need to worry with vets Dirk, Kidd, and Terry on the court. Expect Dallas to finish strong with another consecutive post-season appearance. The Hornets have dropped consecutive games after winning ten in a row. CPIII is looking like a solid MVP candidate right now. In order for them to make a solid playoff run, Trevor Ariza will need to step it up. Where’s the Ariza we saw in a Lakers’ jersey? The Magic’s season can be summed into one word thus far; inconsistent. Orlando must get it together defensively or their season will fall apart. How many uncontested jumpers will the Magic allow next? The Lakers have suffered consecutive loses at home, one being blown out by the hated Boston Celtics. Kobe Bryant has virtually carried this team the past couple games, and unless Pau or Odom step up, they will continue to struggle. As for Artest, I don’t even know what he’s doing on the court. He can’t shoot and he can’t defend. He’s been a big disappointment this season. The Bulls are quietly flying under the radar, having the fourth best record in the league. They are yet to play with stars Carlos Boozer and Joakim Noah, side by side. The good news; Noah just had his cast removed and is a couple weeks from returning. Injuries have slowed this team down just a bit, but whenever the big three are on the court at the same time, they are tough to beat. The Celts are still the team to beat in the East. As long as they can stay healthy, look for another run at the finals. It’s time for the Spurs to saddle up for their annual Rodeo Road trip. If history repeats itself, this is where the Spurs kick it into another gear.